Leaving the European Union could cost Britain's financial sector as many as 100,000 jobs in the coming years, according to a report published Thursday. The sector's contribution to the country's GDP could shrink by as much as £12 billion ($17 billion) by 2020 if voters choose to drop out of the EU in a June referendum, the study by PriceWaterhouseCoopers said. The report was commissioned by TheCityUK, a trade body representing the financial services industry. Its authors warned the financial sector would be hit harder than the overall economy because of its reliance on doing business with other EU countries. The study said finance and insurance generated £65 billion in export earnings for Britain last year, nearly £2,500 per household. "This contribution is at risk if our trading relationships with Europe and the rest of the world are disrupted by leaving the EU," said Andrew Sentance, senior economic adviser at PwC. "The U.K. could recover some of the loss by striking new trade agreements with our EU partners and other countries, though this is not guaranteed and would take some years to negotiate." Vote Leave, the official campaign backing dropping out of the EU, has not responded to CNNMoney's request for comment. The study considered two scenarios for a British exit from the EU, depending on how easy would it be for the country to renegotiate new trade agreements with the bloc. The financial sector would struggle under both, the report said. But the impact would be worse if Britain didn't manage to secure a separate tariff-free trade deal with the EU and had to rely on existing World Trade Organization agreements. Banking and other financial services would suffer from the uncertainty that would follow a decision to leave the EU. The pound has already been hit by the worries, and the study predicts government and corporate borrowing costs would rise. Separately from the report, the Bank of England warned Thursday that leaving the EU could damage the British economy, saying the uncertainty surrounding the vote is already weighing on economic activity and investment. The International Monetary Fund said Tuesday that a so-called Brexit could cause "severe regional and global damage." 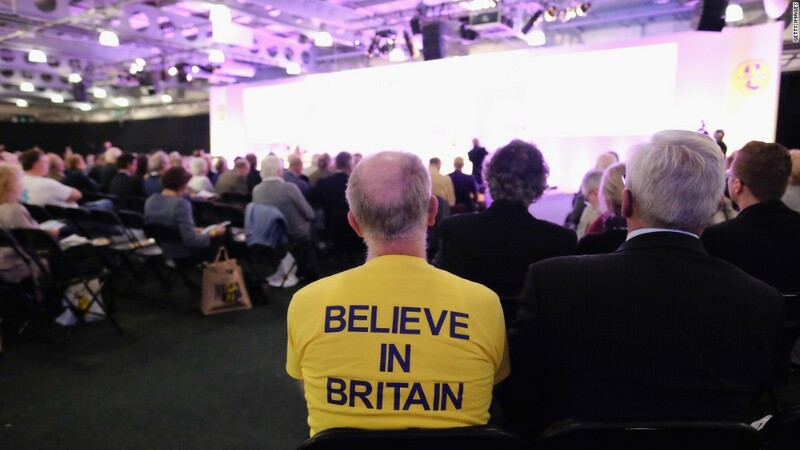 Britain will vote on June 23 whether to stay in the European Union. Opinion polls show the country is deeply divided. Prime Minister David Cameron is leading the campaign for the U.K. to remain an EU member, saying the economic benefits outweigh the negatives. But several high-profile politicians, including members of Cameron's cabinet and the popular London mayor Boris Johnson, are campaigning for a Brexit. They argue that EU membership is costly, creates regulatory red tape and allows unlimited immigration. The financial sector is an important part of the British economy. It accounts for 8% of the country's GDP and 3.4% of all British jobs. London is is the world's top location for foreign exchange trades and the global center for commodities and derivatives trading. Big international banks are overwhelmingly backing the "remain" camp, with some donating large sums to it.